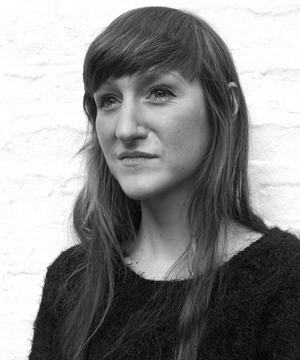 Sara Baume groeide op in Cork en studeerde zowel beeldende kunst als creative writing. Haar verhalen, die in diverse literaire tijdschriften zijn gepubliceerd, werden in 2014 bekroond met de Davy Byrnes Award. Stommelen stampen slaan is haar debuutroman. Lees hier een fragment van Stommelen stampen slaan (vertaling door Jan Willem Reitsma) met dank aan Uitgeverij Querido. A woodpecker lands on the patio table and starts to knock the pointy end of his beak against the pole which holds the parasol up. I am gazing out at the patio while I ought to be writing. Witnessing the woodpecker makes me realise this is the same inconsistent rapping I hear rising from the oak outside my window in the morning. This is my American alarm clock. I had not yet lifted my head from the pillow to check. At my desk in the cabin, I’m trying to write something about an experience I have not yet experienced. All I have is a festival programme. A lattice of electronic strands. Some vacillating expectations. I picture the faces in the programme waiting for me in The Hague with their pens, pages, plectrums at the ready. Now I remember, of course, none of us are there yet. We are still scattered across the globe, oblivious to the small routines of each other’s days. The views beyond each other’s windows, the rhythms by which each of us write. Or sing. Or play. I begin to type a sentence to the woodpecker’s beat, but almost at once, perhaps realising the pole is not a tree and tastes like bitter varnish instead of wholesome wood, he flies away. The music I write by in Iowa started with the soft shrieking of cicadas, lawn-sprinkling systems and mowers. As it became autumn, the music transformed into leaf-blowers, the ticking of my electric heater, the whistle of a distant train. They coalesce into a shambolic sort of symphony. Inconsistent as the woodpecker. Impossible to translate into any language. I give up on trying to write. Douse my screen. Reach for my scarf instead. As the cabin door clicks shut, I meet my woodpecker again. Now he is rapping the timber boards of the cabin wall. He seems less offended by paint than he was by varnish. He ignores me as I pass. And as I pass, I remember: woodpeckers peck, not to make a mark, but to make a noise. Pecking is language to them, music. They peck not to taste, but to communicate. Even though none of us are there yet, I realise, it’s never too early, and we are never too far apart, to begin a conversation. I must extract the electronic strands from the screen of my laptop and cast them out into Iowa. In Prairie Lights bookstore, I can convert them into physical, readable objects. On my aimless walks, I can carry the songs with me, hum them to the footpaths, the river, the chipmunks. Some of the strands make me think of friends faraway in more eclectic, cosmopolitan places, and so, I must throw them to my friends, stretching a new lattice. It seems so inadequate, even absurd, in the aftershock of recent events, to write about the weather. But it is furiously cold today, in Ireland. I am wearing woolly tights beneath my trousers. I am resting the soles of my socks on a hot water bottle. My breath is clouding across the desk in front of me as I type. I remember the first night of Crossing Borders. The Friday. The wind. I returned to my hotel room in the small hours. My mind effervescing with sentences spoken, sung, strummed. I knew I wouldn’t be able to sleep, so I sat up to start my blog instead. I switched on BBC World. I intended it as background, but it could not be contained there. Images of Paris bled into my hotel room, ensuring there would be no easy sleep. I forgot how to sleep for a while, in the Netherlands. I became so convinced I was developing insomnia that I lay in bed and worried all night instead of sleeping. It was still warm when I left Iowa. Winter didn’t catch up with me until I reached The Hague. On my final day away from home, I was obliged to check out of the hotel at noon. My flight wasn’t until evening. I was exhausted and had no room to lie down in. I sat up in cafes instead. Sipping espresso, trying not to nod off. Because, by then, it had become so that when I tried to stay awake, I would fall asleep, and when I tried to sleep, I would remain baldly awake. I looked out at the sopping, windswept city, and the rain seemed absolutely right. In Iowa, we used to compare weathers. My fellow writers came from thirty-three different countries. And so I learned how, in Singapore, the skyscrapers cast whole buildings into perpetual shade. In Mongolia, August is the most likely month for rain. In Saudi Arabia, it gets so hot that men walk around dressed in flowing white gowns. Now I have been a whole week at home. To my fellow writers, I used to describe the Irish climate as ‘moderate’. It never gets terribly hot in summer or terribly cold in winter, I’d say. Then I’d give the example of my house: it requires neither air conditioning nor central heating. But this was a thing I said in summer; I had forgotten the winter cold is terrible after all, that I require woolly tights and hot water bottles. It seems so inadequate, so absurd, in the aftershock of recent events, to write about how cold I am today. Because beyond the window, across the desk in front of me, and the laptop keyboard, and the sentences I inadequately, absurdly type, my sun still pops up in the morning, even though it is a feeble, winter sun. My tide still falls out and draws back in again, even though my sea is freezing. My birds still fly and flock and roost, even though they are only crows. On my final evening in Iowa, I went for a walk in the park by the river. It was dusk and a flock of Brent geese rose up from the water and flew over me, beating their wide wings sleepily, forming the shape of a faulty V against the dusk. On my final full day in The Hague, I venture out for a walk during daylight and again find geese, in the pond opposite the train station. A few are ordinary white, but most are unfamiliar. Patched red-brown and dark emerald, with mahogany eye-masks. I’ve never seen such a species before. Back in my hotel room, I look them up on Wikipedia. I discover they are Egyptian. But, Wikipedia says, some Western European countries have self-sustaining populations which are mostly derived from escaped ornamental birds. How I adore the poetry of this! Of these birds liberated from the obligation to be beautiful, who journeyed all the way from the exotic east to bob on this slimy surface, beneath a grey sky, beside a city. On the final afternoon, I go into a café and pretend I can speak Dutch. I study the menu before I order, practicing the words in my head. I don’t get exactly what I wanted, but it makes me feel slightly less monolingual, just for a moment. On the final evening, I pack things into my swollen suitcase. I take them back out again. I redistribute my belongings between compartments, shuffle them about. Weigh and measure and bend to fit. I think: this is like writing. On the final night, I realise that my best chance of successfully navigating the Koninklijke Schouwburg and the Nationale Toneel Gebouw is to avoid the entire backstage zone. I have no particular difficulty with the performance spaces, but I am baffled by the warren of dressing rooms, narrow corridors, secret tunnels and staircases which don’t appear on any map. Backstage is a cloistered maze. Where the lifts ascend to floors which don’t exist. Where every table is decked in bowls of tiny biscuits and bottles of beer. For the final night, I decide I will just stop and listen. I realise how rarely I actually do this. I am always hurrying, always thinking. All these days they went away… Jonathan Jeremiah echoes. In the crowd, in the dark, I still my limbs, my mind. Through the pink smoke, I study the faintly illuminated faces all around me. I wonder how many of these faces know about the poetry of the Egyptian geese. By the time I am ready to leave the Netherlands, I have not slept in my own bed for seventy-nine nights. Do you know the way from here… Alela Diane sings…to where you’re going to? I don’t. I rarely do. I figure it out. I get there. And I am grateful there is still there for me, grateful I am able to return, and grateful that I have the opportunity to leave sometimes. A day of sleeping off jet-lag slips past, followed by one of concentrated writing. And because the days are short now, so The Hague becomes a city I inhabit mainly in the dark. As curious as I am about my surroundings, I’m also reluctant to demystify them by means of a fold-out map, a flurry of tourism leaflets. Perhaps I like it better once all the galleries and museums and souvenir shops are locked up for the night, the postcard stands put away. My attention swings to the pretty spookiness of the leafless trees and humpback footbridges, the spot-lit stonework of historic buildings. And underfoot, all the different pathways which comprise a single street. Tram lines, cycle tracks, grey brick paving. Slicing through the cement, latticelike. After dark, the poetry of my arrival is replenished. Annelies Verbeke expresses it better than I can. Where does the poem stop and the story begin? She asks. In my hotel room, I keep BBC World playing incessantly, because I cannot bear to write in silence. The prime minister of India visiting London; the dead bodies of babies in Bavaria; the suicide attacks in Paris; the fine weather in Spain. Whereas in The Hague, the wind picks up. It slaps against the flat sides of the hotel and moans. It shakes the flags below my window. Their whooshing sound makes me think of sky-diving, makes me jump out of aeroplanes in my dreams. I wake up once every hour of the night, because so much is happening, and everything is so unfamiliar and intriguing. Even my unconscious brain remains alert, afraid that it might miss something. And yet, when I sit down to write, it’s the minutest details I am drawn to. Not the sight of the Binnenhof, but that of a pot plant on a windowsill in the office block opposite, pressing its leaves against the glass. Not the music of the festival, but the song of a solitary tin can grappling around the square. Wherever and however far I travel, immediately and unthinkingly, I narrow my world back down to the minute, to the familiar. In every story there is at least one character from another story, Annelies says. And in the Karma Lounge, as if to corroborate this, I meet an Irish man who knows the village where I live. Its tidal bay, its oil refinery. Walking back to the hotel alone, through the dark city, I realise why I prefer The Hague by night. There are less bicycles. All day long, they swarm the streets. Queue up in chains along the railings. I don’t understand why nobody ever appears to collide. Perhaps Dutch people are born with the sensibility of starlings, the ability to move altogether in perfect synchronicity without so much as grazing elbows. Perhaps from the sky, every city of the Netherlands resembles a murmuration of bicycles. By the time I make landfall in the Netherlands, I have not slept in my own bed for seventy-five nights. My last city was New York. A hotel room overlooking Times Square. So many floors up I couldn’t even see the people. The music of the city was sirens. As glamorous as this may seem, I’ve spent these recent weeks of transit washing my underwear in ensuite bathroom sinks with complimentary soap. Replacing meals with bags of salted nuts and Hersey bars. Wearing the same pair of battered brown suede boots everywhere I go. I am not well prepared for this trip. In a stopover before Schiphol, the airport grants me two hours of free Wifi. In the frantic final minutes, I google the Dutch for DO YOU SPEAK ENGLISH and THANK YOU. It delights me to find that the word for SORRY is SORRY. I expect I’ll be using this one rather a lot. Apologising for my monolingualism. For being one of those ignorant English-speaking people who speaks only English. The first thing I see in Schiphol is a Starbucks, which is slightly disappointing. On the station platform, I examine a vending machine, trying to identify cultural differences. In the Netherlands, they have some kind of waffle in a lurid pink packet. Otherwise, Dutch snacks appear to be much the same as American ones. I catch a late train to The Hague. There’s something gloriously poetic about encountering a place for the first time in the dark. I try to puzzle the city together out of prancing shadows and winking lights. The first thing I meet on arrival: another Starbucks. In my hotel room, through a miasma of jetlag, again, I look for cultural differences. On a tray alongside the electric kettle, I note the inclusion of three varieties of herbal tea. I think: Dutch people must be healthier than Americans. In the bathroom, I note a sign which encourages me to reuse my towels. I think: Dutch people must be more eco-conscious than Americans as well. I open my window so I can listen to the music of a new city as I fall asleep. The whirr of passing trams. Voices on their night walk home. The grumbling wheels of a suitcase. A bizarre jingling which might actually have been the jet-lag miasma infecting my dreams. In the morning, the chambermaid’s tapping reminds me of my Iowan woodpecker. I get up and stand at the window and search the street for birds. I find the poetry of the city has been bleached away by daylight. My room faces office buildings, apartment blocks. I’ve never been so elated to spot a jackdaw. It stands at a pedestrian crossing as if waiting for the lights to change. They don’t have jackdaws in America. I haven’t seen a single crow since I left Ireland, seventy-five sleeps ago. The green light appears and the jackdaw begins hopping across the street. Entirely oblivious to how happy he has made me.